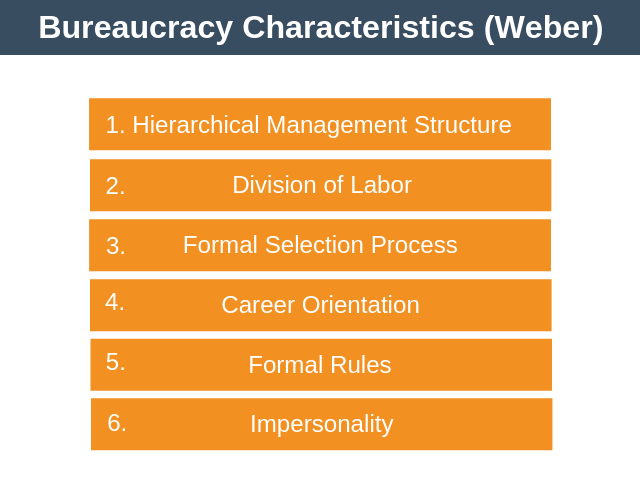 Max Weber’s Bureaucratic Theory of Management proposes that the best way to run an organization is to structure it into a rigid hierarchy of people governed by strict rules and procedures. Bureaucracy is defined in the dictionary as, “a system for controlling or managing a country, company, or organization, that is operated by a large number of officials employed to follow rules carefully”. These days the word bureaucracy is often associated with negative connotations, but at the time bureaucratic theory was developed by Weber it was designed to solve some big problems with the way organizations were being run. Max Weber was a German sociologist born in 1864. He grew up at a time when industrialization meant how employees were organized was becoming increasingly important. Society was moving towards larger and larger organizations, from farms employing a dozen people, to factories employing thousands of people. Weber saw that organizing large groups of people like this presented new challenges, especially when it came to authority. At this time, most organizations were running based on traditional authority, where how well you did was based on who you knew rather than what you knew. Today we call this favoritism, but Weber called it particularism, where a particular group of people had disproportionate sway over the organization. Weber saw that it was unlikely that this was the best way to run an organization. An organizational hierarchy defines how people are structured and fit within an organization. For example, a typical company will have the CEO at the top of the hierarchy, followed by the executive board. Each board member will then be responsible for managers, who in turn will manage employees. Weber wanted each hierarchy to have what he called legal-rational authority. This means that defined authority sits with a position, not with a person. For example, your subordinate would never be able to tell you what to do even if they happened to be the son of the CEO because their formal position doesn’t hold that power. Basically, your authority comes from the position you hold in the hierarchy. Weber referred to this as rational-legal decision-making rules. This means that there should be a set of explicit rules and procedures defining how the organization functions, and that these rules should be consistent with the rules and laws of wider society. Let’s briefly examine each of the six characteristics of bureaucracy in turn. One of the hallmarks of a bureaucracy is a hierarchical management structure. In a hierarchy, each level within the organizational structure controls the level below but is controlled by the level above. Power and authority are clearly and explicitly defined for each position within the hierarchy. Job responsibilities and duties are also clearly defined for each position. Division of labor means that tasks are divided between the employees of the organization. Each employee will be responsible for specific tasks and each department will be responsible for specific functional areas. As an example of this think about how your salary is set and paid within a large organization. Your salary will be set by your line manager, but you will be paid by the Payroll department, rather than the money being paid to your boss who would then give it to you. There are advantages to breaking things up in this way. First, your manager is the person in the best position to set your salary as they observe your performance much more closely than the payroll department. Second, the payroll department are specialists in payroll and ensure you get paid on the same day each month. All employees are treated equally and are hired and promoted on the basis of qualifications, expertise, performance, and experience. There are formal rules and regulations to ensure this selection process isn’t abused. For example, your manager can’t hire someone simply because they’re friends from the golf club. The organization is career orientated, meaning that if you follow the rules and regulations and perform well you will not be arbitrarily fired. In fact, if you perform well you may even have the chance to be promoted or receive a pay rise. In this way, the organization offers each employee the opportunity for a long term career, provided they follow the rules and perform well. There are rules in place that govern how all employees should behave. Managers cannot simply appraise their employees according to their whims. Instead, they must assess employees according to the rules. For example, if you’ve been set a target to make 10 widgets and you make 10 widgets then you’ve achieved your target. Your manager can’t simply decide retrospectively that you should have really made 15 widgets and then fire you for not making 15 widgets. The rules protect employees against this type of behavior. Similarly, there are rules surrounding how we behave, treat, and interact with other employees. The rules are well defined and clear and are applied in the same way to everyone. The rules are there to prevent favoritism or nepotism. If two employees were to enter into a relationship together whilst working within the same department, then often one of them will be moved to a different department or different part of the organization to avoid favoritism and help keep in-work relationships impersonal. Bureaucracies exist throughout society and the business world. Public sector bureaucracies include many parts of government administration, the military, and almost all universities. In the private sector, large organizations are often structured in a bureaucratic fashion, examples include Coca-Cola, General Electric, and IBM. Within the hierarchy, everyone has a specific job to perform. This clear delineation of responsibility and specialization can lead to greater efficiency. Having a hierarchy, rules and procedures enable large organizations to cope with highly complex tasks. It’s almost impossible to imagine how something as complicated as a manned spacecraft could be constructed and sent into space successfully within an organization with no rules or hierarchy. While the hierarchy and rules are there to encourage efficiency they can be very slow to adapt to new situations or information. It is not uncommon for people climbing through the hierarchy to try and maximize their power by having the biggest team possible for purposes of self-promotion or appearing powerful and important. Bureaucracies are often associated with excessive red tape, whereby excessive structure, rules, and processes slow tasks down and lead to frustration for the people trying to get things done to the best of their ability. Bureaucratic theory was developed by Max Weber to address some of the problems with traditional authority. Although the word bureaucracy has negative associations these days there are a number of advantages to having a bureaucratic structure in an organization.